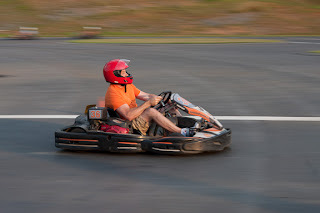 A couple of weeks ago, my son had the opportunity to participate in Karts Against Cancer at Summit Point. His employer wanted to race the karts and so he invited his staff to participate. For Annette and me, this was a great opportunity to get the cameras out and try something a little different than we were used to; panning. We had done panning before with bicyclists in some triathlons, but it had been quite a while. In fact it was such a long while that I forgot some of the techniques that could have helped me with panning. One of the techniques that I remembered on the way home is to: place one of the focus points on an edge of the subject and then strive to keep it there as the subject zooms past. Another technical point that I remembered later was to: choose a place where the subject will stay the same distance away from the camera during the pan. That’s hard to do. The race started with lots of sunlight. It was easy to get a good exposure. But, as the race went on, the sun went down and it became more and more difficult to find enough light to get a fast enough exposure. In fact, once the sun was gone, I had the ISO cranked up as far as it would go and the aperture wide open, yet I was still getting shutter speeds that were too long. 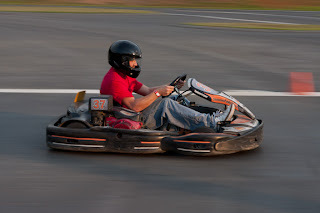 For panning to work, you must keep the shutter open long enough for the background to blur, but not so long that you can’t keep the main subject in the same position on the sensor for the entire exposure. In the first picture below, you can see some carts in the left background. These carts were on the back of the track headed in the direction opposite of the main subject. Since I am panning right and they are going left, the shutter does not have to be open very long for the carts to get blurry. During the two hours of this race, I shot about 200 pictures and only 20 of them were usable. That is a 10% rate. Not too good. Let’s take a look at a couple picture. Look how far the racers in the far background have moved during the time that the shutter was open. The racer is relatively sharp, yet the orange cone is stretched out. In the Corner, Under the Lights. when I found this corner, where the carts made a pass directly under the arc light. I decided not to pan at this corner, but rather I set the camera on the barrier wall as a makeshift tripod. 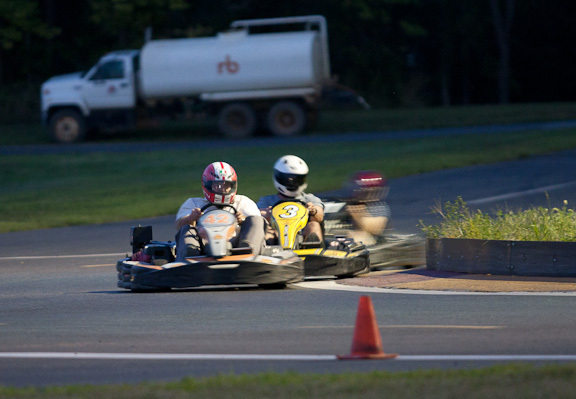 The first two racers were coming straight at the camera and did not move much relative to the camera. The third racer had a lot of right to left movement during the time the shutter was open.